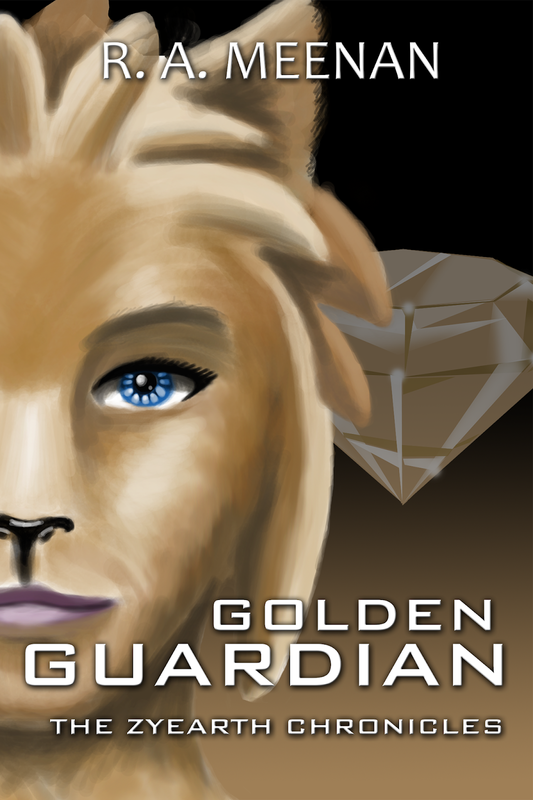 This is Izzy's introduction short story, called Golden Guardian. Izzy Gildspine is a member of the Defender Army, hoping to someday earn the title of Golden Guardian. But before she can do that, she must earn her Gem’s specialty magic... and time is running out. So when the Master Guardian himself approaches Izzy and fellow Defender Roscoe Wendigo with a means to activate her Gem, Izzy immediately takes him up on it. But Izzy quickly discovers that forcing a Gem’s activation is no walk in the park - and now her life is at stake, as well as Roscoe’s. Izzy must find the courage and strength to pass this trial and earn her place as a Golden Guardian... before the trial takes her life. You can buy this story on Amazon here, or get the short story free here, for Kindle or Epub. Not sure if you should check out this story? Let me give you a preview. Here's the first chapter of Golden Guardian! No one truly knows how difficult the life of a soldier is until they choose to become one. The training, the knowledge, the battles, even the social structure. . . no form of media ever successfully paints that life. It’s impossible to understand until you’re in it. Many people simply can’t handle it. I can’t say I blame them. I chose this life, and there are still times I want to leave it. The pressure to succeed consistently wages war with the feeling of inadequacy. And it’s very easy to feel inadequate in this job. Especially when expectations are high, and you aren’t meeting them. Problem was, I wasn’t meeting expectations. And I had to. I was training to be a Golden Guardian. Third highest ranked soldier in the Defender military. I had to meet expectations. There was no other option. Only I didn’t know how. The Master Guardian did, however. And he was determined to ensure I met expectations. Nothing could have prepared me for his plan to make that a reality. The day he took action started out fairly normal. I had taken up residence at a long gray table in the Defender Academy’s main cafeteria, trying to force down a plate of pasta and fruit. The sun glared at me, burning through the golden-brown quills on my head and heating my fur, reflecting its hateful rays at my white Defender uniform. White. The color for someone who hasn’t yet gotten their Gem specialty. Someone who hasn’t activated their magic yet. Someone who isn’t meeting expectations. As I poked at my lunch, the room filled with other Defender students and soldiers. Many still wore the plain black uniforms of a Defender in training, though most of the rookies were still in boot this time of year. Most others wore colors fitting their Gem’s specialty. Teal accents for the elemental users. Navy blue for shielders. White accents for healers. I glanced over at the healers. They were mainly support, dropped into packs to bolster shielders, elementals, and cloakers, aka “the real soldiers.” Healers were absolutely necessary to make the Defenders work, but they weren’t well respected. No one really thought of them as real soldiers. I was glad I wasn’t going to be a healer. I was supposed to be an elemental, according to my family’s long pattern of Gem specialties. I couldn’t be a proper Guardian as a healer. I chewed my lip, turning back to my food. Well. Perhaps that wasn’t entirely true. My father had been a healer and a Guardian. One of the best around in both categories. But he was a fantastic soldier. Strong in mind and body. Sure, I passed the necessary physical tests to be a soldier, but I was no body builder. I needed an element. I couldn’t be a healer. But I was taking too long to get my element. I was the only one in the whole room wearing pure white. It was so hard to ignore the stares the others gave me. Me, a future Golden Guardian, still without power. I stared at him. Matt had earned his Gem specialty in high school nearly thirty-five years ago, at an age before most people were even bound to their Gems. One of the few benefits of being Black Bound, though Matt would likely argue that it was the only benefit. Far as we were concerned, being Black Bound only came with ridicule and fear from average Zyearthlings and impossible expectations from Defenders. Black Bound individuals were rare, and the benefits and drawbacks of being one were not well understood. It did mean we had to learn Gem responsibility early. Most Zyearthlings got their Gems at age twenty. Matt had miraculously bound both of us when he was six and I was four after an event in my childhood I’d rather not explore. Imagine explaining to a four-year-old how to take care of something as precious as a Gem. The magical object their life was now permanently bound to. The whole reason why I could be fifty-five years old and still look twenty, and why I’d live close to four hundred years. The exact problem keeping me from meeting expectations. I poked at my pasta, but didn’t say anything. “Well,” Matt said. “Not the only one.” He pointed to the cafeteria’s entrance. A tall, gray stag with bronze antlers and copper-colored hooves walked into the room and glanced around a moment before heading for the lunch line. Roscoe Wendigo. Just as Matt said, he wore white. Matt grinned and waved at him. I snuck a peek and caught him waving back. “I think he likes you,” Matt said, leaning his head down. “Shut up,” I said, though the blush grew from my cheeks to my ears. “You better or. . . or you’ll regret it,” I snapped at him. “And you’re going to be a Golden Guardian,” Matt replied. I sat straight up and looked to my left. Roscoe stood there with a tray in his hands, smiling at me. Gosh, that handsome snout. Those big, shining eyes. Those soft, felted ears. That gorgeous voice. . . I clutched my fingers tight against my palm and forced what I hope was a decent smile. I shot Matt a glare. “Future Golden Guardians,” I mumbled. I frowned. You’re not alone, Roscoe. As one, everyone in the room stood and saluted, a quick sweeping fist across the chest, heels snapped together. We all turned toward the front door. Master Guardian Lance Tox entered the room. The leader of the Defender military and our country of Zedric. A rare white wolf, sporting ice manipulation and combat skills to match, Lance was probably the greatest Master Guardian ever to walk the halls of the Defender Academy. For Matt and me, he was part terrifying boss, part doting uncle. We grew up in the Defender Academy, doing pretty much whatever we pleased. Lance had indulged all kinds of behavior that most Defenders probably found scandalous. Matt secretly told me one time that he thought Lance did that because he wanted us to enjoy our childhoods before we joined the Defenders. The life of a Golden Guardian was extremely difficult. I think he felt guilty for our parents’ deaths and was trying to make up for them. All that stopped when we officially entered the Academy though. He was still the doting uncle, but he also made it very clear that he was our boss. Our leader. There was no room for shenanigans anymore. Lance crossed his arms behind his back and glanced out over the cafeteria through the small glasses resting on his long snout. As he scanned the room, he caught my eye. I took a deep breath, but said nothing. “As you were,” Lance said, his voice calming, but commanding. He stepped into the room. Everyone went cautiously back to their previous activities. And Lance kept his eye on me. “Defenders,” Lance said, walking up to our group. “Let’s take it in my office. If you’ll both follow me.” Lance turned to the door. I offered him a small shrug. “Thank you for understanding,” Lance said, then led us toward the door. A short walk later and we entered his office. Small, plush, and old, the office sported comfortable wing-backed chairs, a heavy oak desk and walls lined with bookcases filled to the brim with books, memorabilia, and a handful of small statuary, including a foot-tall figure of our dragon god, Draso. His desk held a wire Gem holder, which he dropped his pure white Gem on, and an assortment of papers and computer tablets. All very neat and tidy. All perfectly organized. It’s a good thing Lance never saw my room. He’d be scandalized. Lance took a seat behind the desk as Roscoe and I sat in the dark red chairs. A shot of adrenaline burst through my spine and made my fur stand on end. I had heard rumors about this before. Purposefully forcing a Gem to activate its powers. I didn’t know much about the idea, but what I did know was. . . dark. It was hard. Grueling. Dangerous. And often those that did it ended up in intense psychological therapy after the fact. But those were just rumors. Right? Lance wouldn’t actually do that. Not my doting uncle. And how could I pass up the chance to finally get my powers? Even if it was hard, it’d be worth it. I needed them. It was the only way to be a Guardian. “But we’re up for the challenge,” Roscoe said for us both. “Yes, sir,” I said. Roscoe nodded and the two of us turned back toward the door. We left the room and a shiver ran up my spine. Roscoe rested a hand on my shoulder, doubling the buzzing feeling in my body. As if the ominous adrenaline spike wasn’t bad enough. I looked up at him. He gave me one more smile, then walked off, leaving me in the long hall. I watched him leave, still feeling slightly hot under my fur. I tilted my head for one more cautious gaze at the door to Lance’s office. Lance wouldn’t hurt us. I didn’t care how dangerous things might seem. Lance would never put his people in danger. Especially not his future Golden Guardian. But the buzzing in my bones wouldn’t stop. Been thinking of you and Izzy of late, and hope you and family are well. Wanted to let you know that a motion for self-pubbed authors to join the Furry Writers' Guild just passed by a landslide! Hope you might consider joining, as I think you and Zyearth would make a great addition to the membership.